What many Americans do not know and appreciate is that Weinman designed the well known dime and half dollar coins used in this country. He was a member of the Architectural League of New York and the National Academy of Design. He had studied under Augustus Saint-Gaudens and Philip Martiny and as assistants to Charles Niehaus, Olin Warner and Daniel Chester French. By the end of his life he had received every high honor and award an American could achieve. He was also a president at the National Sculpture Society. His Rising Day and Descending Night, perhaps initially designed as large fountain pieces to be displayed at the Panama-Pacific Exposition of 1915, received critical acclaim and Weinman began firmly establishing himself as one of America’s finest monumental and architectural sculptors. On display at the Brookgreen Sculpture Society are his Duet, Riders of the Dawn which is a fountain in the central pool at the Dogwood Garden, and Narcissus, a marble. 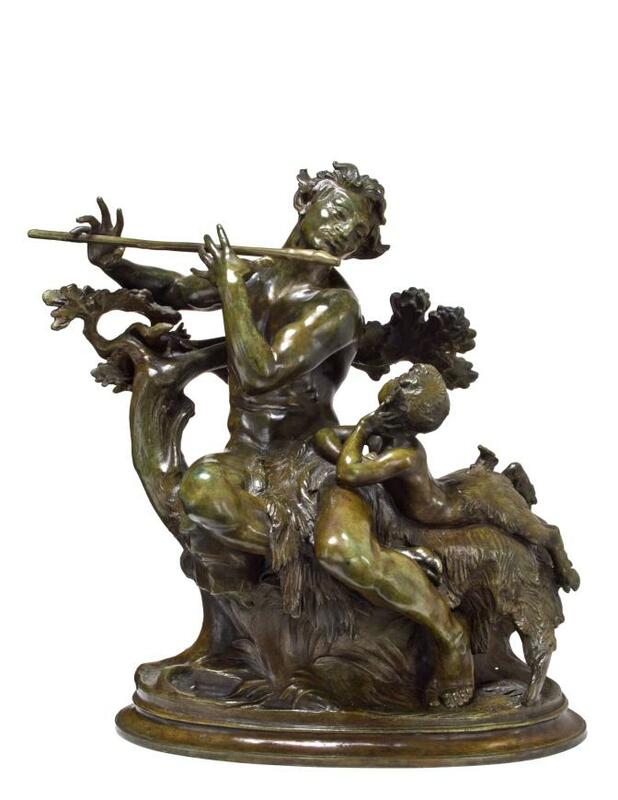 The Duet stands as one of Weinman’s finest individual models and is sometimes referred to as Pan with a Young Faun. While this is a common idealistic allegory sculpted by many Americans the distinctive foliage behind the pair with its feel of Chinese or Japanese art, lend this work a distinction. His work Rising Day, Descending Night and Narcissus are three other iconic works by this sculptor. A same size version of the The Duet is situated in the Brookgreen Sculpture Garden, Murrells Inlet, South Carolina. Often the artist’s finest composition would be dedicated to this famous outdoor sculpture collection. The Duet in Brookgreen has a date of 1924. On a scholarly note, a model of The Duet was exhibited at Hirschl & Adler Galleries in their famous exhibition Carved and Modeled. This cast was noted as having a dark brown patina. It also had a #10 stamped alongside the Roman Bronze Works foundary mark. The markings on the model at Brookgreen display a Gorham Foundary mark, a date of 1924, a copyright and the same type of signature as on ours. Why there would be two casts with a #10 on them is a point of curiousity. The patination on our model is painterly and distinct and of high quality. Both works were probably authorized and overseen by the sculptor. This was an important and probably well received model for this sculptor and one he would assuredly cast in some number as a work to sell to collectors.